Japanese officials are keeping an eye on a part of their country that keeps on growing. They’ve been out to see a remote Pacific island that’s expanding because of volcanic eruptions. They say it’s now 12 times its original size. 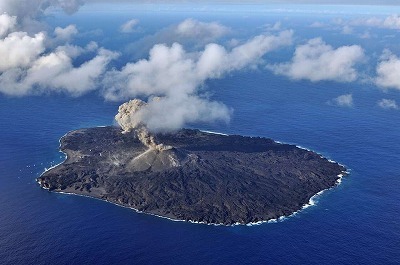 Staff from the Japan Coast Guard flew over the island of Nishinoshima, about 1,000 kilometers south of Tokyo. They say a crater in the center was producing explosive eruptions. They also saw lava flows. The eruptions began two years ago. An island formed next to one that already existed. Lava flows joined the two islands into one, which then grew. The island now has an area of more than two and a half square kilometers. Experts note the eruptions have become more explosive. To your health! とか　単にYour health! とか、Good health! A civil rights leader, who protested U.S.-government treatment of Japanese-Americans during World War II, has been awarded America’s highest civilian honor nearly 30 years after his death. Minoru Yasui was one of 17 people who received this year’s Presidential Medal of Freedom. On Tuesday, President Barack Obama presented the medal to Yasui’s daughter, Laurie, at a White House ceremony. During the Second World War, the U.S. government imposed harsh restrictions on about 120,000 citizens of Japanese descent. Yasui was imprisoned for protesting a curfew on Japanese-Americans. He was later sent to an internment camp. After the war, he continued to challenge the constitutionality of the government’s actions. He died in 1986. Two years later, the government officially admitted its actions were an abuse of human rights. Myanmar’s opposition leader wants foreign ambassadors to lend a helping hand as the country takes another step towards democracy. Aung San Suu Kyi is trying to ensure the change in government will go smoothly after her party’s landslide victory. Aung San Suu Kyi reportedly asked 40 ambassadors to support and monitor the transition. The new government is expected to take office sometime after March. People at the meeting say she told them her party, the National League for Democracy, plans to set up a team to handle the transition. The Nobel laureate also said she wants to discuss changing the constitution with the military chiefs. A quarter of the seats in parliament are reserved for members of the military. On the economic front, she suggested reviewing projects involving illegal land seizure, but she stressed the NLD isn’t against foreign investment. My mother was grateful to your kindness.